Believe it or not, eating wasn’t always as easy as going to a restaurant and picking something from the menu. In fact, there was a time when humans didn’t even have grocery stores! Yes, I know it’s hard to believe while sitting in front of your computer only steps away from your refrigerator, but it’s true. Popular science has a fairly convincing timeline that, for humans, begins around when we started to create tools to obtain food. We used these tools for hunting, foraging, and of course primitive fondue parties. As our tools became more sophisticated, our agrarian civilizations began. Fast forward several thousand years and we can barely recognize ourselves as coming from such hard-working ancestors as those. Today life is so much different that given the same tools that were available back then, most of us probably wouldn’t survive a week. Despite this, some people assert that humans are natural predators, which is often used to justify modern non-predatorial eating habits. 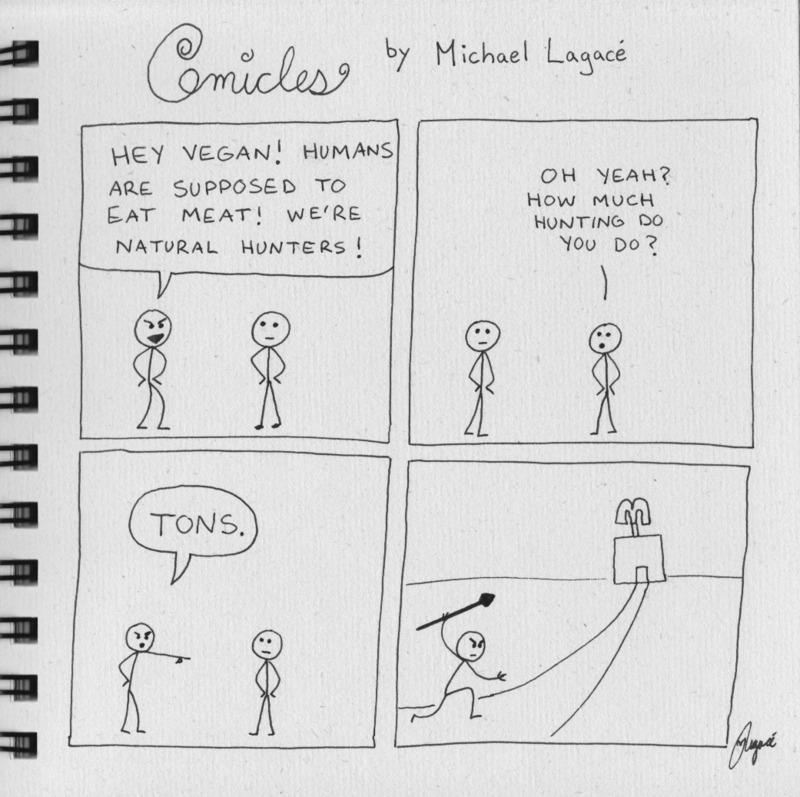 I used this argument too when I was an omnivore, even though I rarely ate the animals that I killed. 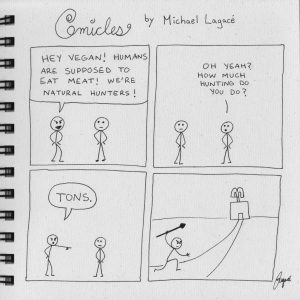 Nowadays, I tend to believe that humans used to be natural predators, but if we actually had to hunt again, I don’t think it would come naturally. We might know what to do, but actually doing it well enough to survive is a different matter indeed. These days the most fighting we do for food is over the last slice of pizza. Regardless of the few physical characteristics that might put humans in the ‘predator’ category, I think it’s pretty obvious that ordering a hamburger isn’t the same as tracking a cow by smell and ripping her apart with your teeth. We might like to think of ourselves as the superior species at the top of our food chain, but perhaps it would be more accurate to use our current habits to define ourselves now: former predators (once removed) whose diets revolve around the weekly value menu and marketing. Oh, and whatever Oprah’s eating. Almost a year ago, I had finished eating an avocado and decided to put the seed in a planter. A few months later there was a stem sprouting from the seed, with some little green leaves flourishing at the top! I was fascinated by the insistence of life, which is what inspired me to plant a balcony garden. I’ve taken pictures of Little Avi’s progress over time, such as the day he got his own place. He loves his new digs. On the way home last night I shared a taxi with an Austrian couple. They’d been in Vancouver for six months, and I asked what they thought about it so far. In Austria, he said, he only paid fifteen dollars a month for the equivalent cell phone package he has now. Here, though, he pays sixty. To be honest, mine is even more than that, which is all very absurd. Those companies must return substantial profits. There’s a lot of growth in that industry these days. Leave it to a night at the bar to remind me why I spend very few nights at bars. When I was younger, I didn’t mind that the music was too loud, and I didn’t mind that it was too cramped. I guess this is one of the hundred other indicators that I’m getting older. Avi too. Just under a year old, and just over a meter tall. He’s a perfect reminder that if the conditions are right, you have to use the opportunity to thrive. Do something you love doing long enough and it’s bound to pay off. Otherwise, who knows, maybe you didn’t really love it as much as you thought. Without exaggeration, I can say that I haven’t been this excited about music in a long time. I’ve been exploring my guitar again, and now there’s a beautiful puzzle unlocking at my fingertips. I’m seeing sounds as shapes now, hearing subtleties I’ve never noticed. A complex system of notes and patterns that make sense in a way I’ve never known. For the first time in fifteen years, I’m starting to understand this instrument. It’s all very, very exciting. On a related note, the Great Big Project is becoming more defined. 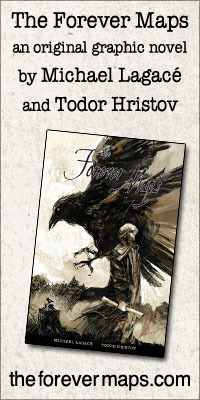 All these stray ideas are coming together in harmony; characters are developing, plot is advancing, conflict is building. I used to know how it was all going to end, but now I’m not so sure. Even I can’t predict it any more. I’ve been looking at various web sites that may help me develop my own future. I’m seeing opportunities at every inconvenience. Possibilities. There’s a theory that exists wherein every possible decision creates its own alternate universe. In one of them I might be a pilot, in another a rock star, and in another I’m sitting here in this same chair with a different shirt on. Nobody really knows where any decision will lead, but I think that when we do what we love, we compile good decisions that lead to good outcomes. I’ve got a pretty solid compilation going on. Let’s see how this all plays out. These are the conditions where Vancouver shuts down. Overnight snow, morning rain, a city covered in dreary frozen slush. I saw a bus this morning give up at Vine Street, and you can tell everyone feels the same way. In this weather, the city just stands still, a remarkable feat for such a busy place. Last week I was the key witness of an assault. The mindlessness of it all sits in my memory, reminding me of how sudden everything can be. We’re in such a rush that we lose our minds over things that don’t matter. Maybe this weather is the universe telling us to slow down. Racing from one moment to the next, we barely see the blur in-between. This new year has aged me. We do grown-up things without even noticing them, and then one day it all catches up. We realize exactly where we are. Be mindful that time does pass by, that good things do come, and then go. Each moment will be the only one like it. Focus. Make it the one you want. 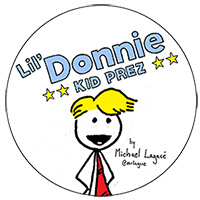 This Comicle has been been kicking around in my head for a long time now. 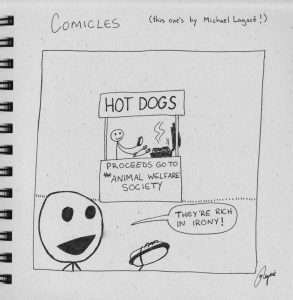 In it, a generic Animal Welfare Society is raising money by selling hot dogs. 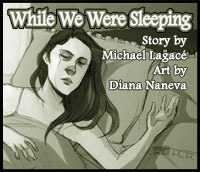 The idea didn’t just spring up out of nowhere, though, it’s based on something that I actually saw years ago. 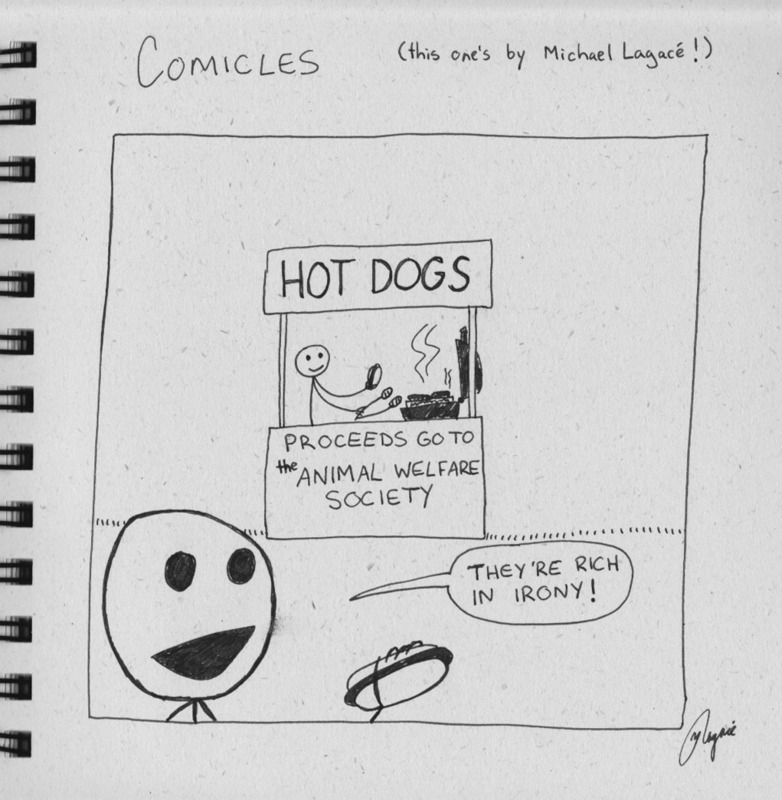 See, even before I stopped eating animals, I knew that hot dogs were made from various animal parts. You can imagine how surprised I was to see this booth raising money to save some animals by cooking other animals. Some people don’t have a problem with this irony, though. There’s a fairly prevalent belief that some animals deserve our compassion while others do not, an opinion often based on things like cultural traditions, animal personalities, appearance, and taste. I no longer share this belief. I think it’s an outdated habit that we could all benefit from revising, because after all, isn’t that how societies evolve, by changing the habits that no longer quite make sense?